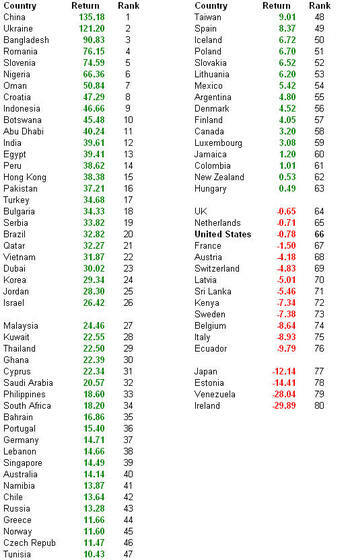 Interesting to note that Venezuela is this year's worst market performer. 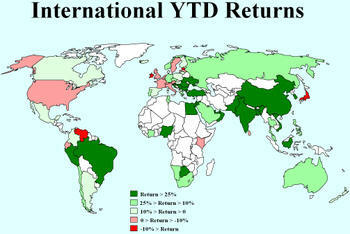 In 2006, Venezuela racked up the best percentage gain return in local currency terms (up 156%). I had to wonder at the time how much of that gain was a reflection of the country's growing inflation. Can you help me understand equity returns? I've been looking at investing in some Newburyport Real Estate, but I honestly have no idea what I'm doing. My brother told me that right now is the time to invest in land, and I want to do it! What are equity returns, and how to they relate to real estate?